Normally when I am in Fort Collins I go indoor rock climbing every Friday evening with friends. But for this summer, my friend Diana suggested that we go outdoor climbing a lot more than we have in the past. Of course, I was keen on that idea. 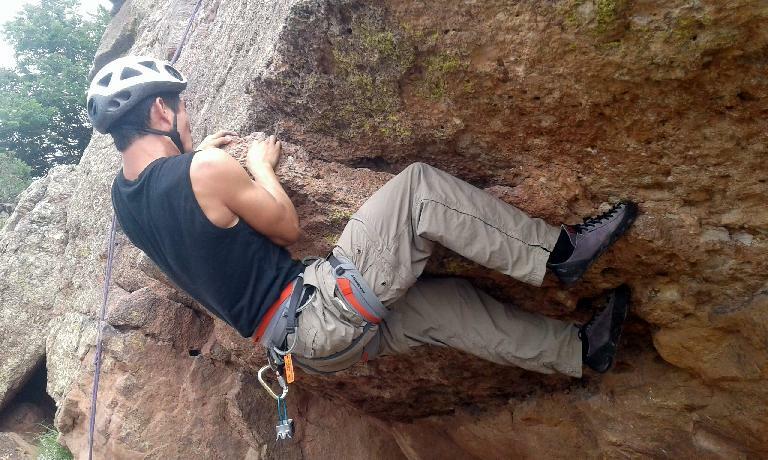 There was a time when rock climbing was a favorite sport second only to bicycling, and were it not for time constraints I would be spending much more time climbing with Mother Nature than on colorful plastic holds inside a gym. 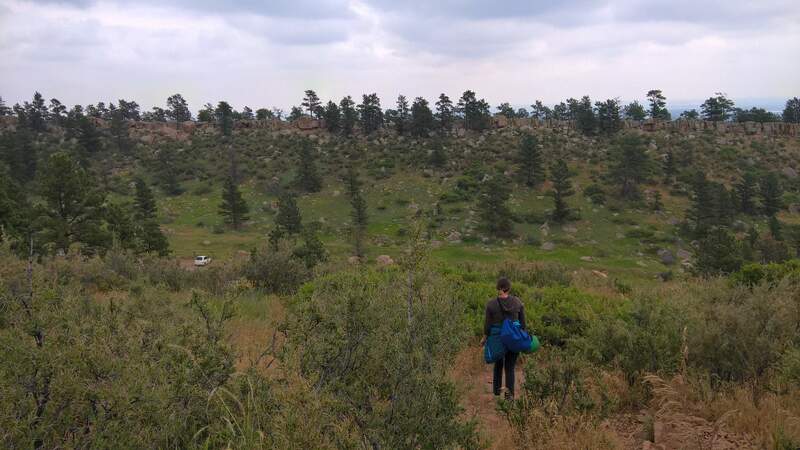 I proposed Duncan’s Ridge for our first outing of 2016 since it is very close to Fort Collins. It also has a mere 0.15-mile (albeit steep) approach and is very quick to set up some top ropes. 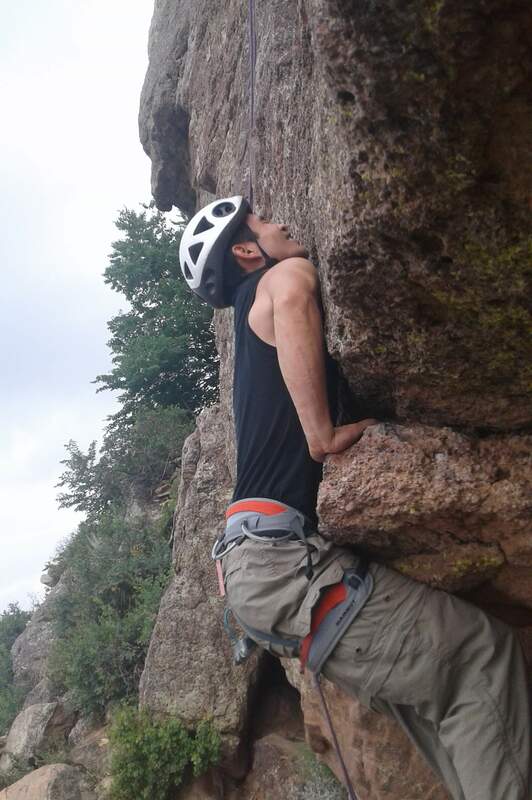 “Good way to ease back into outdoor climbing,” I said. Climbing here goes back at least to the 1960s. The name was given in honor of Duncan Ferguson (an extremely modest, non-self-promoting, and one of the most graceful climbers) who came here and probably climbed every line here during training sessions taking advantage of the area’s proximity and accessibility as this area was his escape from the crowds at Flagstaff and Rotary. As was Duncan’s practices, he rarely gave much effort to publicizing his ascents other than to his close associates. Some, like Steve Bass, would go up for hours at a time, up/down climbing every move, until he could send in preparation for other mentally challenging routes. Other notables who frequented the area include: John Gill, Mike Storeim, Dan Hare, Scott Woodruff, Brad Gilbert, Jeff Stringham, Jamie Logan, Sam Shannon, Alan Nelson, Tom Kelly, Steve Mamman, John Long, Scott Blunk, Mark Wilford, Lizz Grenard, Malcolm Daly, Ken Decker, Ken Duncan, Steve Bass, Jim Brink, and Craig Luebben. Thus, Duncan’s was originally a highball area for most climbers. It was a training ground to get used to longer runouts while on lead for those who liked headgame routes. It became a mostly toprope area as more of the masses found the rock to their liking. The tradition and style of the first ascents was ropeless or using clean gear. Unfortunately, some if not most of the history has been passed down by mouth incompletely, which has led to the younger climbers not recognizing (or perhaps respecting) the history and traditions here. 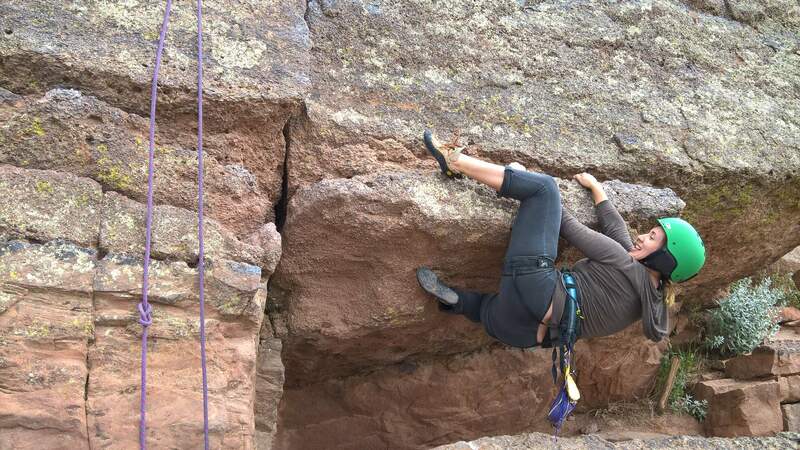 Over the years, some of the “respect the ethics of the first ascensionist” has not been passed on fully to the “next generation.” Further, the sheer numbers of climbers have pushed some of the “older generation” to climb more elsewhere. Over the decades, bolts have appeared, mostly at the top of the cliff, but they have often been “chopped” as the traditions were to leave nothing behind. Duncan Ferguson would spend afternoons soloing up and down the ridge probably doing most every route done there today. Duncan’s legacy may help explain why some feel that retro-bolting the ridge is a travesty. More recently, the area has come under the closer inspection and regulation of the Larimer County landmanagers. The Northern Colorado Climbers Coalition has come about after the turn of the century and has tried to be an advocate for climbers in the area. The NCCC has worked out an agreement with Larimer County in 2015 that has sanctioned fixed anchors, perhaps unknowing of the history and traditions of the area, in an effort to reduce erosion at the tops of the cliffs and injury to trees used as anchors. Additionally, the NCCC, or at least one of its members, has begun to add some bolts to previously climbed lines which has led to some controversy (as is common with retrobolting routes anywhere). Indeed, it did look like there was one route (Conglomerate Face)where someone had removed or broken off one of the two top bolts. We set up a single route on Corner Climb, then, which if you stay on route is rated a 5.7. 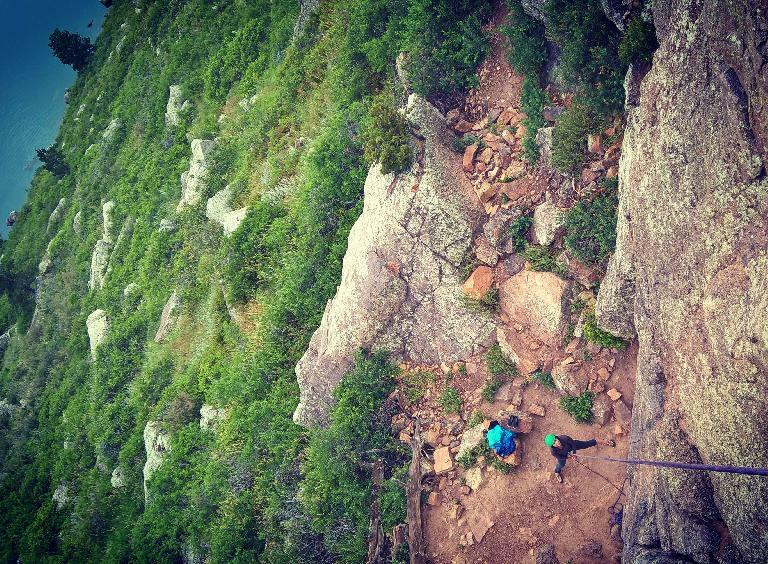 We did multiple variations: one on route, another slightly left, and another even more left so that we were actually climbing Conglomerate Face (5.7+). 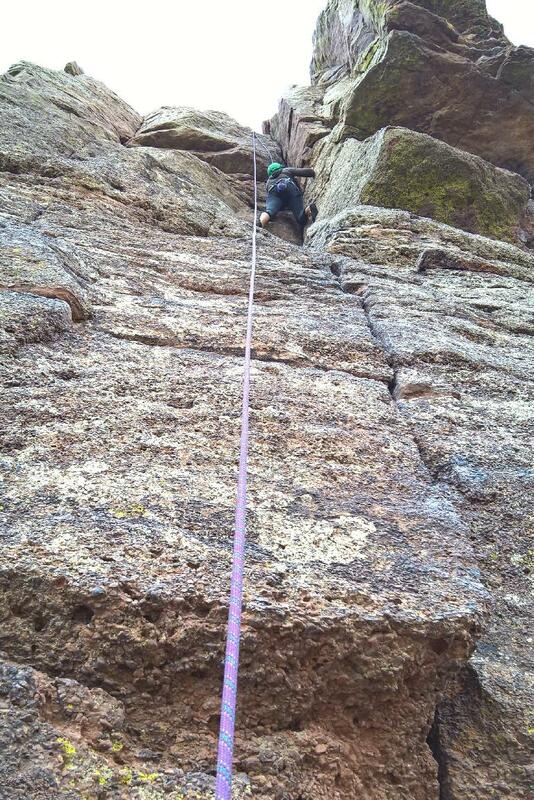 I also climbed the left side of Roof Route (5.10), but only did the section directly underneath the huge overhang of that route since our rope was not set up for that climb. So my variation was probably more like a 5.8+/5.9-. The weather started out a little drizzly but as soon as it stopped the rock dried out almost immediately. Almost no one was here except for a hiker and a happy dog that I greeted at the top of my third climb of this Friday morning. There were, however, powerboats and waterskiers in the Horsetooth Reservoir below. It was a pretty awesome sight.